Thailand's badminton queen Ratchanok Intanon has a special place in the hearts of Indians as the 24-year-old walked away with her third India Open women's singles title in New Delhi on Sunday. Intanon not only became the first player to complete a hat-trick of wins in the India Open but also achieved a personal achievement against China's He Bingjiao who she beat in the Yonex Sunrise India Open final in straight games - 21-15, 21-14 - at the KD Jadhav Indoor Hall. Having lost to the Chinese in her previous four meetings the Thai ace achieved a personal first as she outclassed the third-seeded Bingjiao in 46 minutes to pocket the USD26,250 in prize money that came with the title. Intanon is very popular with her large base of Indian fans from the time she won her first title in 2013. The former world champion won her second India Open title in 2016. Known for her trademark bow with clasped hands, Intanon gave a thumbs-up sign and waving to her fans before rushing off to hug her coach. She also melts the hearts of her fans and supporters with her trademark smiles. After all Intanon, a former three-time world junior champion hails from the Land of Smiles. "I was determined to break the jinx against Binjiao after losing all my four previous meetings against her," said Intanon, adding that the support from the fans in the stands was also a contributing factor for her win. Intanon next heads to Kuala Lumpur for the USD700,000 Celcom Axiata Malaysia Open which begins at the Axiata Arena in Bukit Jalil on Tuesday - the first venue where she won her first world tour title this year - the Malaysia Masters. 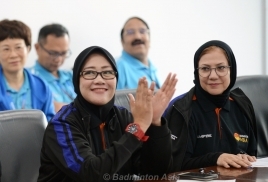 The women's doubles title went to Indonesia's top seeds Greysia Polii-Apriyani Rahayu who retained the title with a 21-11, 25-23 win over Malaysia's third seeds Chow Mei Kuan-Lim Meng Yean. China won the mixed doubles title with No 1 seeds Wang Yilyu-Huang Dongping winning 21-13, 21-17 against Indonesians Praveen Jordan-Melati Daeva Oktavianti to pocket USD27,650 in prize money. The losers took home USD13,300. Lee Yang-Wang Chi-Lin of Chinese Taipei continued with their fairy tale run in New Delhi by taking the men's doubles title. In the battle of the unseeded pairs, they brushed aside Ricky Karandasuwardi-Angga Pratama 21-14, 21-14. 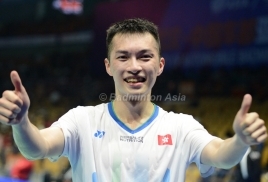 In the first round, Lee Yang-Chi-Lin packed off Russians Vladimir Ivanov-Ivan Sozonov, the fourth seeds, and in the semi-finals ended Europe's challenge in the event when they bundled out top seeds Kim Astrup-Anders Skaarup Rasmussen of Denmark. Host India ended empty-handed when K. Srikanth, the third seed, went down 7-21, 20-22 to Denmark's Viktor Axelsen in the men's singles final.